It has been fourteen years since My Big Fat Greek Wedding took America by storm and grossed $241 million domestic on a $5 million budget. It's a wonder that this isn't the third or fourth sequel to the film especially given writer and star Nia Vardalos has found little success outside of her Greek origins. Vardalos has written three features in between her Wedding features, none of which reached the commercial success of her breakout and thus the reason we're likely back here. If you enjoyed getting to know the Portokalos clan then you will no doubt enjoy their company this time around as well. Not much has changed beyond some of the dynamics shifting given the inescapable fact time does go on, but this seems to be the major point of issue for Vardalos when crafting the script: how might one develop characters who are so stuck in their ways? To answer this question and provide some deeper insight into who these people are (or more accurately who they once were and how they've become the characters we see today) Vardalos undoes the basis of the entire family: she discredits her mother and father's marriage by revealing it was never properly acknowledged by the church. For Gus (Michael Constantine) and Maria (Lainie Kazan) this more or less makes the lives they've been living for the past fifty years something of a sin and a sham. Of course, Gus wants to correct things as quick as possible and have his marriage acknowledged by the church, but with this new found information Maria is eager to soak up her new found freedom and make her "husband" earn her love for him, elaborate proposal and all. 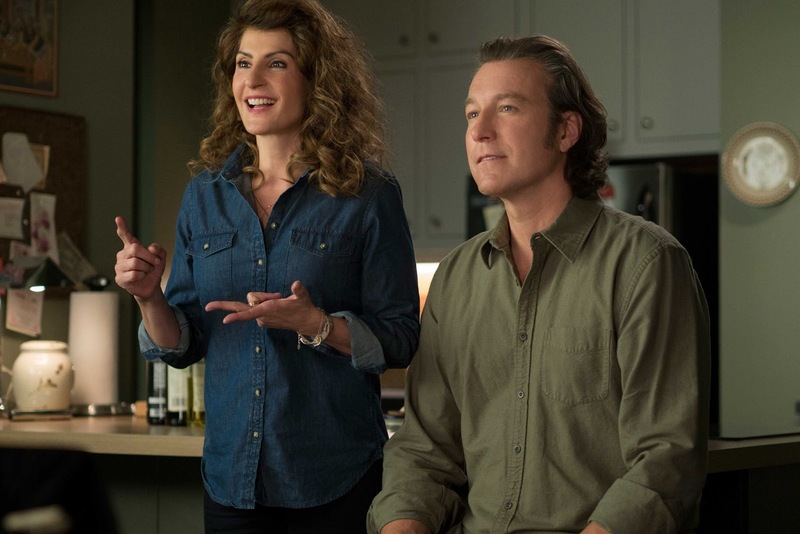 Couple this with Toula (Vardalos) and Ian (John Corbett) dealing with the impending high school graduation of their only daughter, Paris (Elena Kampouris), and there's more than enough material for Vardalos to mine obvious comedy out of without actually mining the characters for any real insight or genuine arc. Toula (Nia Vardalos) and Ian (John Corbett) are dealing with their daughter readying to leave for college. Still working in her parents' Greek restaurant, Toula is now the mother of a teenager who is beginning to mirror her own parents from the original film. Daughter Paris is growing up fast, hates her Greek heritage, and can't get out of town for college fast enough. The couple from the original big, fat, Greek wedding is experiencing a lack of romance in their marriage due to the strain of Toula stressing over losing her daughter not to mention her parents impending nuptials. Naturally, in the process of planning another of these titular events the Portokalos family drives everyone else out forcing them to have to take care of everything themselves. Somehow, Ian has learned to simply accept his in-laws for who they are despite their overbearing tendencies. Ian is the principal at Paris's school and so while he has more or less settled into his role as Mr. Toula Portokalos, seeing his daughter grow up and accepting the fact she wants to move away is making him realize how much has actually been lacking in his marriage. Vardalos indeed draws on some relevant, albeit obvious, marital issues that undoubtedly come up when a couple have been parents for so long they forget what it means to be a couple, but overall the focus of this sequel unfortunately doesn't remain on Toula and the woman she's become in the time between the first and second films. 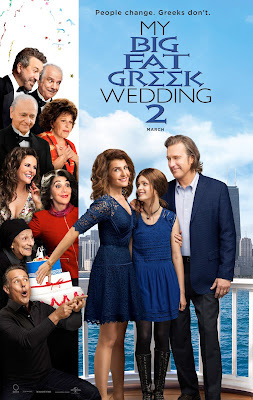 Having to live up to its title, Vardalos is forced to shoehorn in the necessary logistics that reveal her parents have never been married and thus the family needs to come together to throw a wedding for the ages. There is also an unnecessary subplot about Gus attempting to prove he's actually a descendant of Alexander the Great by going through an ancestry website that supersede's the more interesting dealings in his rocky relationship with his brother, Panos (Mark Margolis). 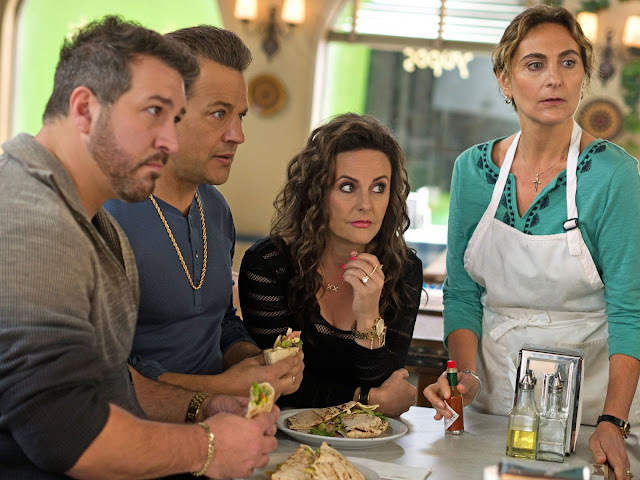 Other tidbits are thrown in including Angelo (Joey Fatone) and his marital status, Aunt Voula (Andrea Martin) and her persistent craziness as well as the single faceted characters such as Nikki (Gia Carides) and Nick (Louis Mandylor) who stick to what they do best which is styling hair and being a clueless oaf. Oh, and there's a running joke concerning the grandmother, Mana-Yiayia (Bess Meisler), which is maybe the best thing about this entire affair. The thing is, if you enjoyed the first film you know what you're getting into and you will likely have the same amount of fun with this new adventure given it is exactly what you expect it to be. There's nothing wrong with this approach given the place in our culture that the original carved for itself and it would have of course been more of a risk to try and break the formula, but while Vardalos seems to have penned this script more out of wish fulfillment for the studio rather than the passion and inspiration that fueled the original it also seems she couldn't help but to fall in love all over again with these characters and in turn she has clearly put some love and care into documenting where each of these people would be at the current stages of their lives. With the original film taking place only fourteen years ago and Toula and Ian having a seventeen/eighteen year-old daughter this sequel even takes place a little further into the future than our own reality allows and so Vardalos is not only catching up, but she is imagining in a way as well. The most interesting facets Vardalos is able to explore this time around deal with Toula's own realizations about where she thought her life would go and what it has become. Given the original came out so long ago and despite the fact I did see My Big Fat Greek Wedding during its original theatrical run, but not since-I can only remember a handful of moments. Most of those moments revolve around Windex clearing up acne given I was fifteen at the time and had a bad case of acne myself. The original likely deserves a re-watch and an older, hopefully wiser perspective on the original might offer some of the same insights I took away from this sequel, but as of now what is most effective are the strands of questioning that hint at a deeper, more fully realized Toula who wonders about the difference between hugging and suffocation or if a family sticking together means you inevitably get stuck. Coming from a big, close family myself such ideas resonate. I just wish they would have somehow manifested themselves more in the narrative rather than simply becoming the afterthoughts they end up. The entirety of the Portokalos clan is back in My Big Fat Greek Wedding 2. We don't turn to a film like My Big Fat Greek Wedding 2 for insights about life or for it to somehow enlighten us to parts of ourselves we didn't recognize before. Maybe we should, but we don't. Instead, the mandate of something like a sequel to a fourteen year-old surprise hit that falls squarely into the romantic comedy genre is that it provide enough laughs and solid enough distraction for an hour and a half that we feel the price of the ticket was justified and in the case of My Big Fat Greek Wedding 2 it is, at least a matinee ticket. Vardalos and the entire crew I think realize this and in filling in this quota Vardalos the screenwriter overlaps the obligatory wedding plot with that of Paris's senior prom and her aspirations/nervousness leading up to the dance dealing with the fact she has a crush on a boy (Alex Wolff). While there is not enough of it the film also addresses Toula and Ian's lacking relationship by having them attempt to rekindle some of the romance so radiant in the first film. Corbett, while more of a minor supporting player here than anything else, is still the most charming and grounded of all the characters only making us wish there was more of him and his dynamic with Vardalos present in this sequel. The movie also finds reason to introduce characters played by John Stamos and producer Rita Wilson for no other reason than to utilize Stamos and Wilson. Rob Riggle also shows up as a college rep for a single scene that is elevated by Riggle's presence alone, but outside of these fun drop-ins the performances are fine enough as its clear most of the cast is simply having a good time being back together. It is from this camaraderie that the movie tries to teach us that the adventure of making a family is an adventure in itself and more than enough to be proud of. It's a nice sentiment, it's the same realization Toula comes to the first time around, and it's impressed upon Paris this time around with the latter actually spreading her wings to create a fine balance between those well-intentioned hugs and the suffocating feeling it's hard to tell the difference in sometime. In the end, the most important lesson we learn is that "Greeks don't creak" which can only mean we'll likely be seeing the Portokalos again soon(ish).